Using a Content Delivery Network (CDN) is a must for any serious website owner. Along with fast WordPress hosting, using a CDN is critical to the success of your website. Using a WordPress CDN is much easier to set up than it once was, but it can sometimes be confusing. 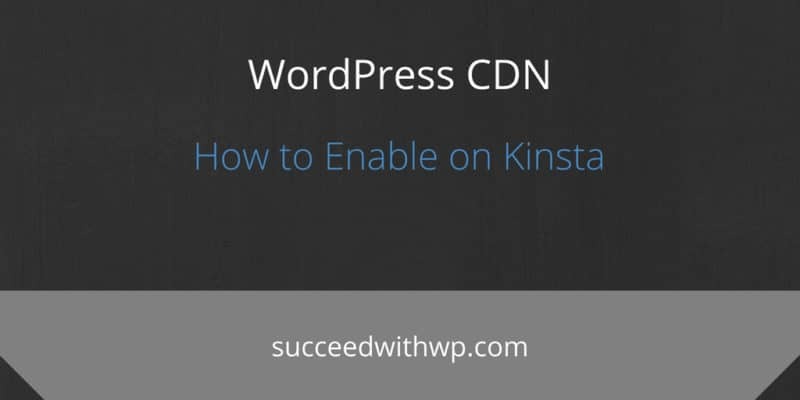 In this post you’ll learn what a CDN is, what’s used for, and how I use a WordPress CDN with a Kinsta Managed WordPress hosting plan on this website. CDN stands for Content Delivery Network. The “network” refers to a group of web servers located in various locations around the world. These servers each contain a copy of your website pages and they work together to load those pages faster for your users. Not only do they load pages faster but also the files loaded within your pages. These files can include web objects (text, graphics and scripts), downloadable objects (media files, software, documents), applications (e-commerce, portals), and even live streaming media. Your visitors won’t wait for a slow loading site. Your visitors will visit more pages on your site, leading to better numbers in Analytics. Higher visitor numbers allow you to demand higher pricing on your “influencer” services. If you’re building a business with an exit strategy in mind, you’ll have more visits to backup your acquisition costs. Fast loading sites are proven to be better for converting visitors to customers. But let’s be honest, I also used “CDN and WordPress” in the heading above because, if you’ll notice, I’m trying to optimize this post for the terms “WordPress CDN”. I’ve been focused on creating cornerstone content pieces on this site as part of an overall Cornerstone Content Plan. In my Kinsta review article, I shared my journey with migrating this website to a Kinsta Managed WordPress hosting account. In that article, I purposefully didn’t optimize the site for speed in any way. I was only concerned with the speed increase I would see from simply switching hosts. 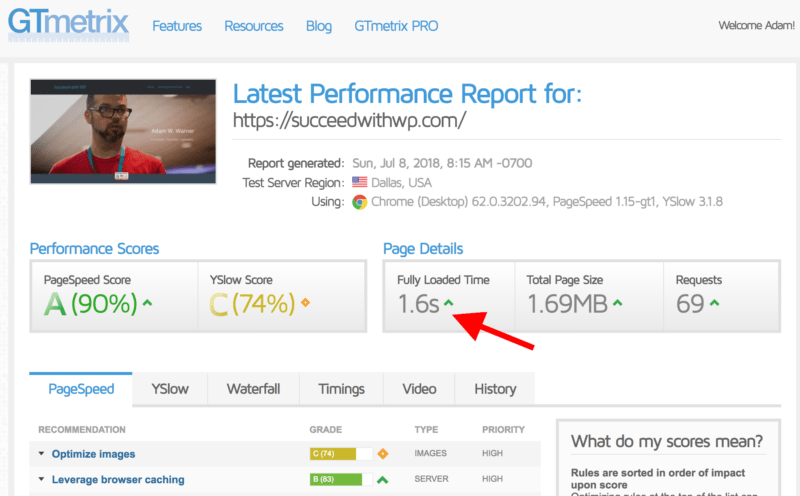 I saw an immediate increase in speed which you can read about here, but optimizing a WordPress website for speed involves more than just your host. The next step after moving to a fast hosting environment is to set up a CDN. 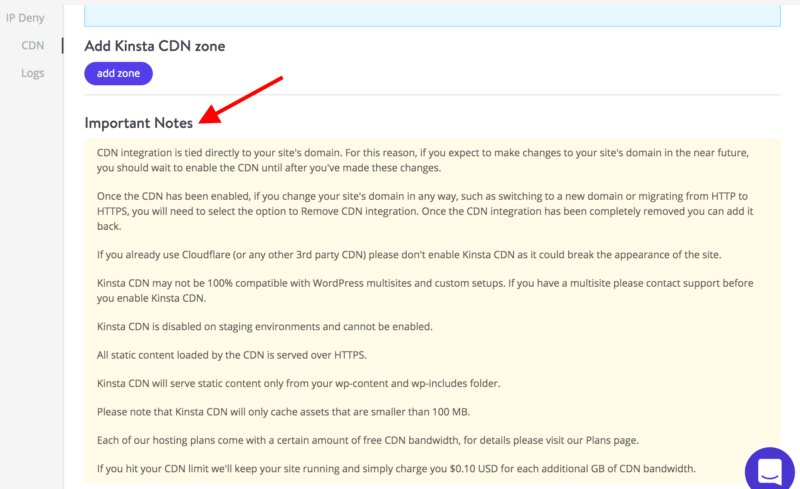 Luckily for me (and you), Kinsta plans include a CDN option by default. You just need to set it up and that’s what we’ll do together below. Visit the Sites section of your Kinsta dashboard and click Manage button next to the site you where you want to enable a CDN. 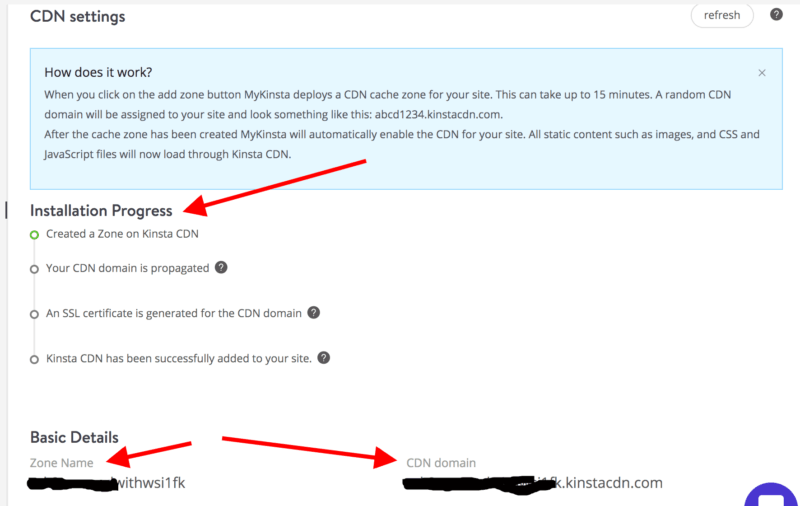 Click the CDN menu item to reveal the CDN Settings and to Add a Kinsta DNS Zone. Read the documentation and Important Notes. 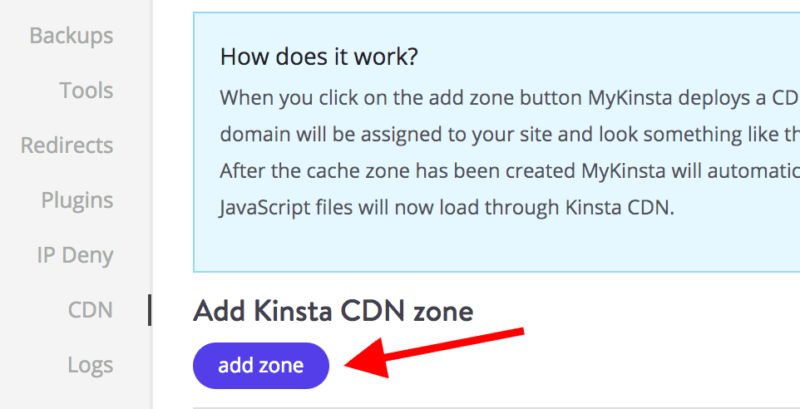 Click the add zone button below the Add Kinsta DNS Zone heading. 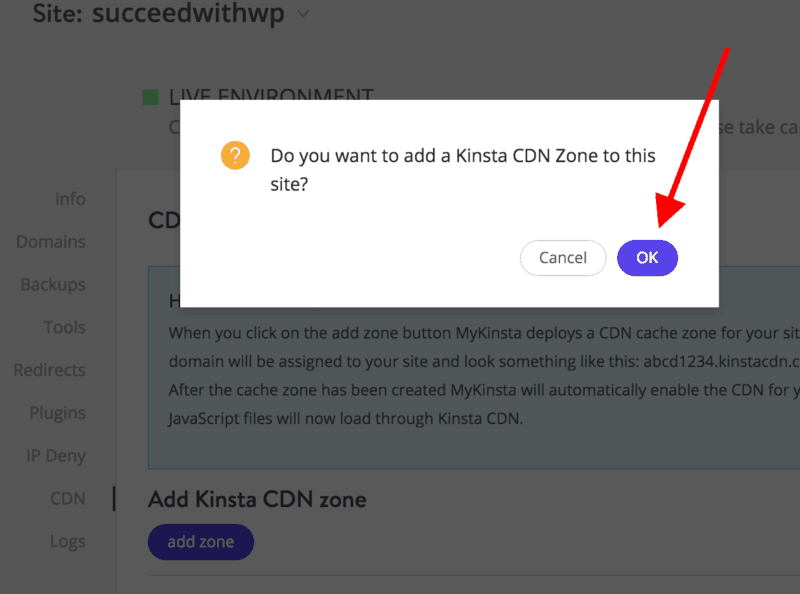 Confirm that you want to add a Kinsta CDN Zone by clicking OK.
Congratulations! Your WordPress CDN is now being installed. 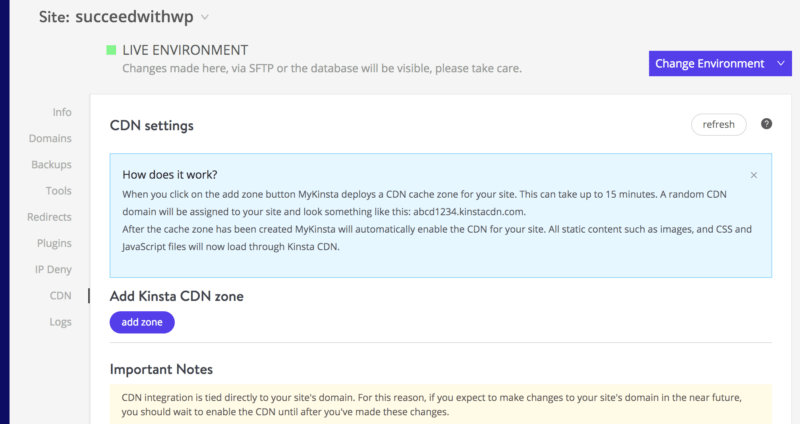 Kinsta gives you a nice breakdown of the steps to expect along with the Zone Name and CDN domain. Clicking the question mark next to each step informs you how long each step should take. All total, about 30 minutes. You have at least 30 minutes to kill. Stand up and stretch. Get another coffee. Go for a walk. Ok, I’m back. Let’s test again and see what effect a CDN has on our site speed. 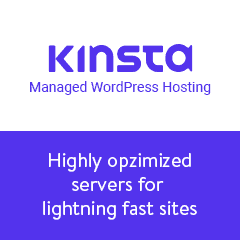 If you read this post, you’ll know that just by moving to Kinsta, the page load speed of this site increased from 2.3 seconds to 1.8 seconds. My hope is that employing a CDN will get the page to load somewhere near 1 second. 1.6 seconds. Previously 1.8 seconds. That’s a 0.2-second increase. That’s better of course, and there’s nothing wrong with that result. Especially since the Kinsta CDN Zone was so simple to set up. I didn’t yet get faster results with all the locations I tested in GTmetrix and Pingdom, so I contacted support to confirm I had everything set up correctly. Kinsta support reported that everything looked good and also offered an explanation as to why the speed hadn’t increased much in those other locations…yet. The first couple of times a given resource is accessed from a given geographic area the resource has to be pulled from our servers out to the associated Key CDN location. So in the case of the other GT Metrix locations test, it looks like nothing was out on the CDN yet as there hadn’t been any traffic from that area to the site since the CDN was enabled. If we test it a few more times and get cache hits from the CDN we should see an improvement there. Rather than sit here and test all day, I’m going to wait a few days to let some organic traffic hit the site from around the world and test again. I’ll be sure to update this post with the results. If you noticed on the image above, the Optimize Images recommendation received a C Grade. As I said before, optimizing a website for speed is a multi-step process and I still have work to do. So far I’ve switched to a faster host and have employed a CDN. Stay tuned to this site for more tutorials on optimizing a website for speed and more by subscribing by email below.